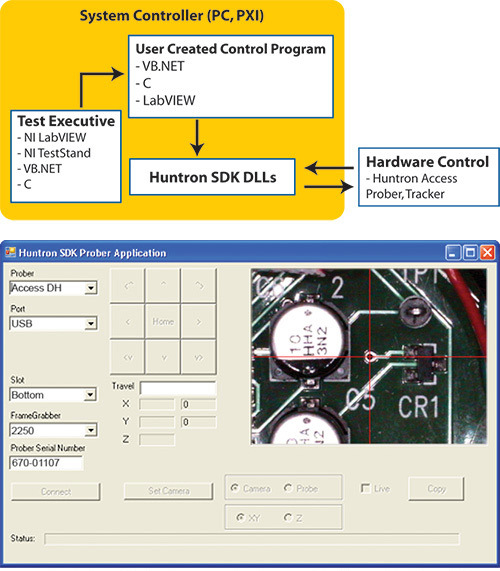 The Huntron SDK allows creation of programs that implement control of Huntron hardware products. Using in-house programming or integration services, the SDK allows the creation of custom software systems. The SDK also allows existing programs to be modified to control Huntron hardware. The SDK provides control primarily of Huntron Access Probers but includes other Huntron hardware such as Trackers and Prober cameras. The SDK includes all DLLs needed to control the hardware and sample applications in VB.NET. The DLLs are .NET assemblies with built-in COM interfaces. The DLLs are documented in help files with VB.NET, VC++ and C# prototypes. The system shown here was one of several made for a customer who needed to place a specialized hybrid component into a custom test fixture for long term testing. The components are picked up by the Prober Z axis head using a custom suction system and placed into a bed-of-nails type fixture that requires significant downward pressure. A long term stress test is then carried out for several hours. The suction is routed through durable tube placed into the cable bundle of the Prober. The Z axis drive was designed to handle heavier loads and have increased downforce. A leadcsrew system was used to achieve this goal. Control of the system uses a custom software application developed by the customer using the Huntron Hardware SDK. The image on the left shows the inside of the Z axis head mechanism. The customers fits the final pieces of the suction system to the Z axis shaft when they receive the Prober. 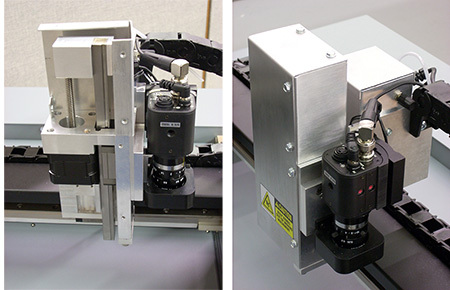 The image on the right shows the Z axis head with the covers installed.